I took the photo above in 1999 when I visited the Sachsenhausen Memorial Site in Oranienburg, Germany. Now a regular reader of my blog has returned from a trip to Sachsenhausen where he took some fantastic photos of the mass graves, which you can see on his blog here. and then later, push a button—with a security camera in your face—to request re-entry into the memorial. When I visited Sachsenhausen in 1999, the mass graves could only be accessed by a revolving gate at the north exit of the Memorial Site, and there was no re-entry. Visitors who exited the Memorial Site to see the mass graves had to return to the parking lot by means of a road that ran along the west side of the former camp. Sachsenhausen was one of the three major concentration camps in Germany; the other two were Buchenwald and Dachau. The camps in Germany were mainly for political prisoners and illegal combatants who were captured during World War II; most of the Jews were “transported to the East,” to Auschwitz and Majdanek, or to the three “Operation Reinhard” camps at Treblinka, Sobibor and Belzec. After World War II, Sachsenhausen was in the Soviet zone of occupation. The Soviet Union set up Special Camp No. 7 at Sachsenhausen, which was an “internment camp” for German prisoners. According to an Information Leaflet, which I picked up at the Memorial Site in 1999, the former Nazi “preventive detention camp” at Sachsenhausen was converted by the Soviet Union into Zone I for German civilians who were arrested and sent to the Sachsenhausen camp without a trial. 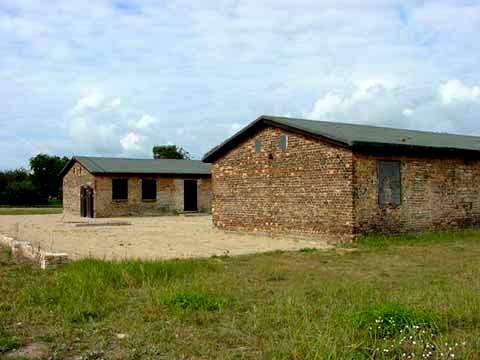 The brick barrack buildings at the north end of the Sachsenhausen camp, which the Nazis had used as a Special Camp for Allied Prisoners of War, were initially converted into Zone II for Soviet citizens who were awaiting return to the Soviet Union. Some of them were former concentration camp prisoners who were looked upon as traitors to Communism; they were waiting to be sent to the gulags in Siberia. Two of these brick buildings are shown in the photograph below. In August 1945, these brick barracks were used by the occupation forces of the Soviet Union as part of their prison camp for German citizens who had been arrested without charges. The Sachsenhausen camp was liberated by soldiers of the Soviet Union on April 22, 1945; most of the prisoners had been marched out of the camp, and only the prisoners who were too weak or sick to walk had been left behind. The Soviets set up internment camps, in their zone of occupation, along the lines of the gulag system in the Soviet Union under the Communist dictatorship of Stalin. In the Gulags that were created by Lenin and extended into a huge complex by Stalin, millions of people were required to perform forced labor for the development of the Soviet Union. Lawrentij Berija, the head of the Soviet National Commissioner’s Office of the Interior (NKVD), had already made provisions by January 1945 to secure the hinterland of the advancing Soviet Army. Members of the German Army and civilians captured by the Red Army during its advance were placed in camps immediately behind the front lines in order to be deported to the Soviet Union. Following the completion of the war negotiations, these camps were replaced by so-called Special Camps that were intended for long-term internment and imprisonment. Within the German territory occupied by the Soviets, ten camps were established, five of which were in Brandenburg. They were not under the authority of the Soviet Military Administration in Germany, but were administered by a department of the NKVD in Moscow. According to the files released by the Soviet Union, a total of approximately 60,000 German prisoners were held in the Sachsenhausen Special Camp No. 7 after World War II ended. The bodies of approximately 12,000 prisoners who died of starvation and disease were buried in unmarked mass graves in three locations: the Commandant’s Yard in the front of the north exit of the Memorial Site, on the dunes on Schmachtenhagener Street, and in the Schmachtenhagener Forest on highway B 273 between Oranienburg and Schmachtenhagen. 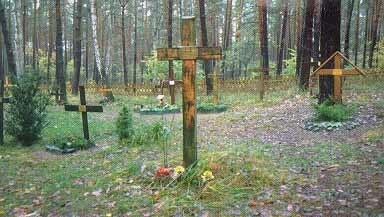 The photograph above shows the graves in the Schmachtenhagener Forest. A total of at least 12,000 prisoners of the Special Camp in Sachsenhausen died from the conditions of their imprisonment, from disease and chronic undernourishment. During the harsh winter of 1945-46, when the already insufficient food rations were again halved, prisoners died in masses. 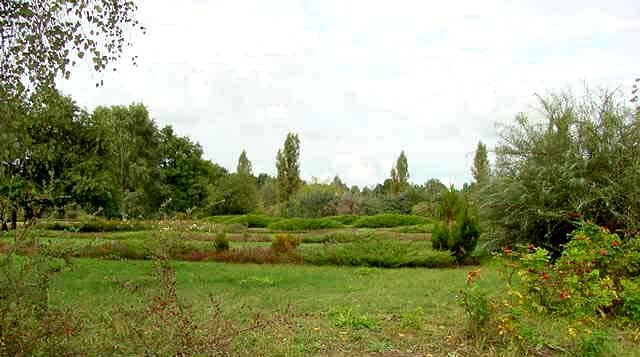 The dead were hastily buried, naked and without identification, in mass graves in the surrounding area of the camp. Because every form of contact with the outside world was strictly forbidden, particularly receiving news from relatives, the Special Camp was often referred to as the ‘Camp of Silence.’ After the camp’s closing was propagandistically reported in the press in the spring of 1950, it was not permissible to speak of the camps in the German Democratic Republic. Even in the west zones of occupation and later the Federal Republic of Germany – where organizations like the ‘Fighting Group Against Inhumanity’ and the ‘East Offices’ of the SPD and CDU had tried to procure and spread information about the ‘Camps of Silence’ – by the end of the cold war the camps were completely forgotten. Only after the breakdown of the Communist system in the G.D.R., when three mass graves of the Sachsenhausen Special Camp were discovered, did ‘Stalin’s camps in Germany’ return to the public consciousness. Former prisoners spoke openly about their memories and placed a memorial stone on the northeast camp wall in 1990. A permanent exhibition on the history of Special Camp No. 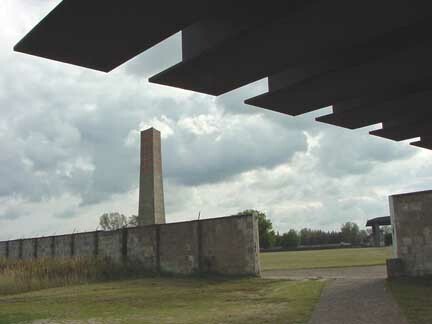 7 is housed in a museum which has been built in the former Zone II, an area which was incorporated into the Sachsenhausen Memorial Site in 1995. My 2001 photograph above shows the overhanging roof of the Special Camp No. 7 museum, which is located just outside the triangle which is the former prison enclosure. The museum building is black granite with no windows; the interior is completely dark with spotlights shining on the displays. In 2001, the museum included a lot of Nazi documents which served to explain why the Germans received such harsh treatment by the Communists in Special Camp No. 7. In 2001, this was not a museum devoted to exonerating the victims; it was highly critical of the Nazi regime, but perhaps it has changed since I visited. On the right side of the photograph above, one can see the structure which formerly covered the ruined crematorium building and gas chamber. You can see photos of the new structure that has been built at Station Z on this blog. I previously blogged about the gas chamber at Sachsenhausen here. The stone fence, on the left side of the photograph above, separates the Sachsenhausen concentration camp enclosure from Zone II where the brick barracks formerly housed Prisoners of War and later German army officers who became prisoners of the Communist Soviet occupation forces after World War II. The monument to the anti-Fascist resistance fighters can be seen in the center of the photograph. Until recently, the Sachsenhausen camp was virtually unknown in America. I had never even heard of it until September 1992 when a fire was started in the Jewish Museum by “right-wing extremists” and this was reported in my local newspaper. You can read about the Jewish Museum on my website here. A documentary about four of the young boys in Block 66, the barracks for orphan boys at Buchenwald, was released in April 2012. You can read about the film here. Elie Wiesel is the most famous survivor of Buchenwald, but he is not among the four survivors who returned to Buchenwald for this documentary. Elie was an orphan after his father died in the Buchenwald camp, but he claims that he was in Block 56, a barrack for adult men. I previously blogged about Elie Wiesel in Buchenwald here. The boys in Block 66 were protected by the Communist political prisoners who ran the camp. It is implied in the film that the Nazis were trying to kill all the prisoners at Buchenwald, and the Communists had to decide which prisoners that they would save. In the last days of World War II, before the Communists took over the Buchenwald camp completely and drove the Nazis out, the SS administrators of the camp ordered all the prisoners to report to the Appelplatz, from where they would be “death marched” out of the camp, or put on trains and taken to other concentration camps, such as Dachau. A photo of the death train at Dachau is shown in the film. I previously blogged about a death march out of the Buchenwald camp here. Ken Waltzer is one of the narrators in the YouTube video about the film. At 0:39 seconds in the video, you can see a young boy, who might be one of the two boys, who were at Buchenwald. Who shot the lock off the gate into Dachau when the camp was liberated? 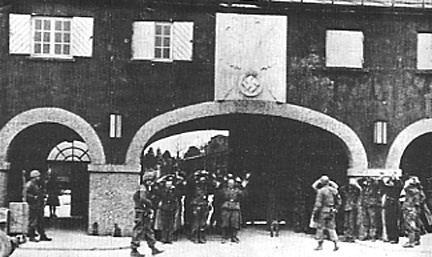 The photo above shows the gate into the Dachau concentration camp. 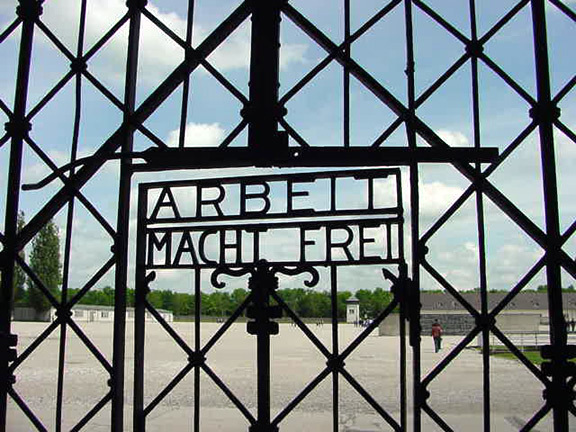 The gate is wide enough for vehicles to enter the camp, but it also has a pedestrian gate, which is the section that has the “Arbeit Macht Frei” sign over it. The pedestrian gate was opened and closed by remote control from inside the gatehouse, which is shown in the photo below. As far as I know, the pedestrian gate had no lock which could have been shot off to open the gate. The whole gate could be opened by removing the bar across the top of it. Accompanying [Julius Eisenstein] on the dais was George Katzman, in the olive-green jacket he wore in 1945 as his U.S. Army platoon shot the lock off the gates of Dachau and liberated the 30,000 prisoners there. Katzman, also 92, gave testimony in the documentary from the liberators’ viewpoint. It is not clear to me whether Katzman said that his U.S. Army platoon shot the lock off the gates of Dachau, or the reporter who wrote the story added this detail. I searched and searched on the web and could not find any information about which U.S. Army platoon George Katzman was with on the day that Dachau was liberated. There were two divisions involved in the liberation of Dachau: the 45th division and the 42nd division. 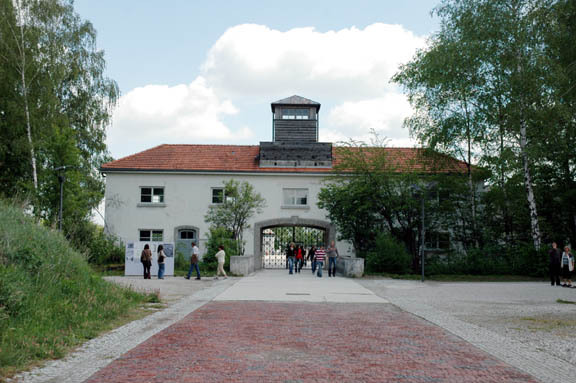 The Dachau concentration camp was inside a 20-acre complex that included an SS training camp. To get to the gate into the concentration camp, one had to first go through the main gate, or one of the other gates into the complex. In his book The Rock of Anzio, which is the history of the 45th Thunderbird Division, Flint Whitlock quoted extensively from what Lt. Col. Felix Sparks told him about the liberation. According to Sparks, 45th Division soldiers arrived at the concentration camp gate shortly before the three jeeps carrying officers of the 42nd Division drove up. Whitlock also quoted Pfc. William Donahue of the 42nd Division who said that he was already at the “Arbeit Macht Frei” gate into the concentration camp when the men of the 45th Division arrived at the gate. Some of them had been drinking, according to Donahue. John Degro, a soldier in the 45th division, claims that he shot the lock off the gate into Dachau, before the 42nd Division soldiers arrived, but Flint Whitlock does not mention John Degro at all in his book. It is not clear to me when and how Degro could have shot the lock off the gate, nor how the gate would have been secured again, once the lock was destroyed. Lt. Col. Sparks told Whitlock that his orders had been to liberate the camp and then to secure it and not let anyone in or out. If Sparks passed these orders down to his men, then John Degro would have been disobeying orders when he shot the lock off the gate and then let some of the prisoners out, as he claims. In his book about the liberation, John H. Linden (the son of Brig. Gen. Henning Linden) mentioned that it took an hour to get all the prisoners safely back inside, once the gate had been opened by the men of the 42nd Division. According to Lt. Col. Sparks, as told to Flint Whitlock, he met Brig. Gen. Henning Linden just after Linden arrived in a jeep at the concentration camp gate. Prior to this, Brig. Gen Linden had accepted the surrender of the concentration camp from SS 2nd Lt. Heinrich Wicker near the gate at the southwest corner of the camp. 1st Lt. Cowling, of the 42nd Division, claimed in a letter to his family that he had entered the concentration camp while Brig. Gen. Linden was still talking to Lt. Wicker. According to Flint Whitlock’s account, Brig. Gen. Linden told Lt. Col. Sparks that Marguerite Higgins, a newspaper reporter, wanted to enter the camp to get the story on the famous people that were prisoners at Dachau. Sparks replied that his orders prohibited anyone but his men from entering the camp. By this time, the prisoners had come out of their barracks and were rushing the gate; they were also climbing up to the windows of the gate house and trying to get out, according to Sparks. Sparks reiterated his orders, adding, “Look at all those people pressing against the gate.” Undeterred, Higgins ran to the gate, removed the bar that was holding it shut, and was nearly trampled by the mass of prisoners attempting to get out. Sparks and his men were forced to fire warning shots over the heads of the prisoners to regain order and reclose the gate. However, Higgins mentioned in her news story that all the prisoners were inside the barracks when she first entered the camp. Was she asking permission to enter the camp a second time in order to interview the VIP prisoners? If so, she was out of luck because the important prisoners had all been evacuated on April 26th for their own safety. While General Linden and Colonel Sparks were talking, Higgins went up to the gate and removed the restraining bar. This caused panic and the prisoners began rushing toward the gate. We were ordered to fire in the air and push the inmates back in behind the gates. It is clear from these quotes that the lock on the “Arbeit Macht Frei” gate into the concentration camp did not need to be shot off. The whole gate could be opened from the outside by removing a bar which locked it. 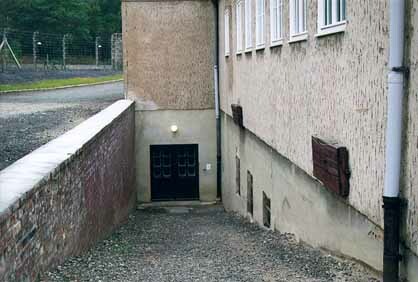 The pedestrian door could only be opened by remote control from inside the gatehouse. There were SS guards inside the gatehouse, waiting to surrender. Twelve of them surrendered to 1st Lt. Cowling, according to John H. Linden, the author of Surrender of the Dachau Concentration Camp 29 Apr 45, the True Account. 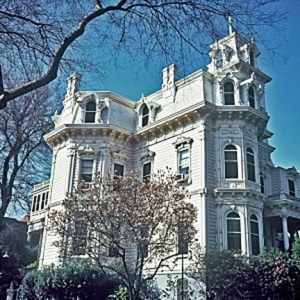 The mansion had been scheduled to close on July 1, 2012 due to state budget cuts. It was saved as a state park by donations, totaling $100,000, from Raley’s grocery and the Church of Scientology. 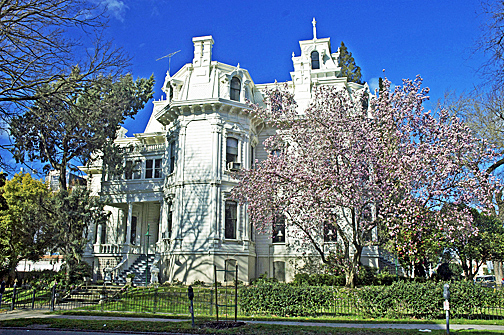 The California Governor’s mansion is located at 1526 H Street in downtown Sacramento. 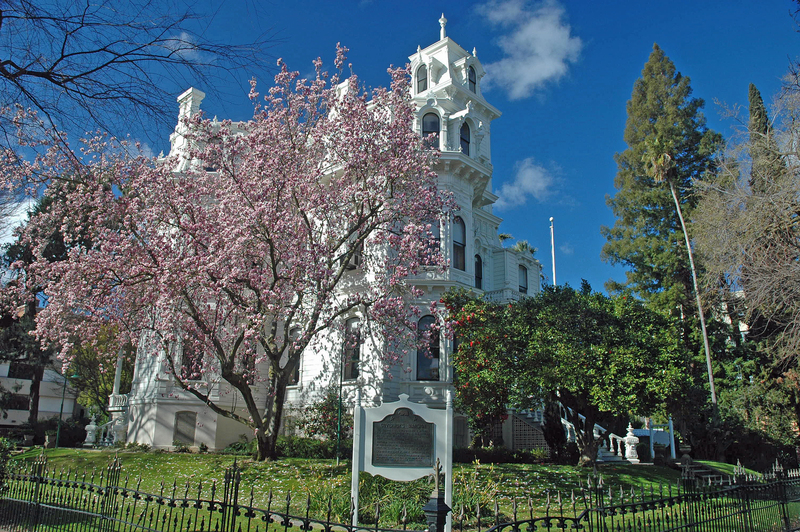 It was used as the home for 13 California governors during a period of 64 years. The last governor to live there was Ronald Reagan, who stayed there for 3 months, before Nancy Reagan insisted on moving to the Fabulous Forties, which is Sacramento’s most beautiful downtown subdivision. The donations will allow the mansion to remain open to visitors Wednesday through Sunday from 10 a.m. to 5 p.m. for at least one more year. 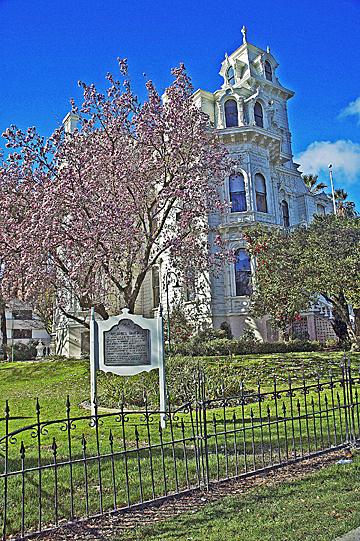 The large tree with the pink flowers is a magnolia tree; the large bush on the right side of the photo is a camellia bush. 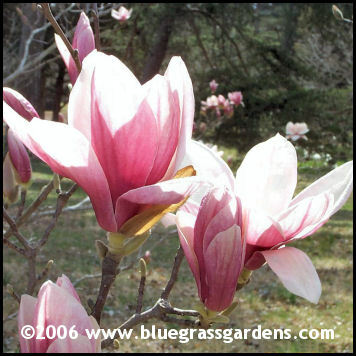 The photo below shows a close-up of the pink flowers on the magnolia tree. Ravensbrück is one of the few Nazi concentration camps that I have never visited. I am writing about it today because the subject came up in the comments on my last post, which was about Joe the Plumber, who thinks that the Holocaust was allowed to happen because Hitler instituted gun control in 1939. One of the regular readers of my blog, The Black Rabbit of Inlé, who has just returned from a trip to Germany, wrote a comment which included a link to his photos of the Ravensbrück crematorium and the memorial stone that marks the spot where the gas chamber was located before it was destroyed by the Nazis on April 23, 1945. Wait a minute! The Ravensbrück gas chamber was destroyed a week before the camp was liberated by the Russians on April 30, 1945? This sounds just like the story of Auschwitz-Birkenau, where the Russians arrived on January 27, 1945 and found that the Germans had destroyed the gas chamber on January 20, 1945. Very suspicious! Another coincidence is that all the records from both the Auschwitz camp and the Ravensbrück camp were confiscated by the Russians. The Ravensbrück records have never been released. The existence and operation of a gas chamber are not in doubt. Seriously? The gas chamber at Ravensbrück is not in doubt? Everything about the Holocaust is in doubt. Ever hear of “Holocaust deniers”? Ever hear of the Lachout Document? You can read the text of the Lachout Document on my website here. Ravensbrück is one of the camps that is included in the document. Note that, on my website, I have a link to The Nizkor Project which claims that the Lachout Document is a forgery. I consider the deathcamps.org website to be the best of the True Believer Holocaust websites. You can read their page about the Ravensbrück gas chamber here. The last gassings happened when the Swedish Red Cross was in the camp to compile transports with weakened prisoners to carry them to neutral Sweden (via the still occupied Denmark). Strangely, the same thing happened at the Mauthausen concentration camp where the Nazis were gassing prisoners while the Red Cross was taking prisoners out of the camp. In his account of the liberation of Mauthausen, the Red Cross representative, Louis Haefliger, confirms that the “annihilation” of the prisoners in the gas chamber continued until Commandant Ziereis fled the camp on the night of May 2-3, 1945. Apparently the Nazis were gassing as many of the prisoners as they could, while at the same time, the Red Cross was allowed to take selected prisoners out of the camp. However, there are some uncertainties surrounding this issue, caused in part by the SS’s destruction of the gas chamber in the closing days of the war, and by their virtual annihilation of those prisoners who worked in the crematorium and gas chamber. The SS did a quite thorough job of destroying evidence that might be used against them. Following the war, the Russians did not help matters by keeping researchers out of the camp and making sweeping changes, turning it into a military post. In April 1945, the Ravensbrück prisoners, who were still able to walk, had been marched out of the camp toward one of the sub-camps. Eventually the marchers reached the Allied lines and were liberated in early May, 1945. To his credit, author Jack G. Morrison includes the story of the liberation of Ravensbrück in his book on page 303. That night (30 April) the Russian arrived. Rather than being liberators, they put the French women [prisoners] through a more hellish ordeal than what they had experienced in the camp. The women were raped repeatedly by the Russian troops, to the point where some of them were too weakened to continue their journey [the march out of the camp]. When Soviet forces liberated the subcamp at Neustadt-Glewe, they raped all the women and girls: Jewish, Hungarian, German — it didn’t matter. One of the prisoners at Ravensbrück was Odette Sansom, a British SOE agent, who was allegedly having an affair with the camp Commandant, Fritz Suhren. When the march out of the camp started, Odette rode with Fritz Suhren in his car to the American lines where he surrendered on May 3, 1945. He was expecting Odette to put in a good word for him to save himself from being charged as a war criminal, but she refused. After the war, there were rumors that Odette had survived Ravensbrück because she had been the mistress of Suhren, who was a handsome man. But Odette claimed that her toenails had been pulled out while she was a prisoner at Ravensbrück. Strangely, Odette was the only one who was tortured this way even though she had told her captors that she was married to a relative of Winston Churchill. Did Fritz pull out all of Odette’s toenails to convince her to sleep with him? Is that why she refused to testify on his behalf? Odette was one of the three SOE agents who survived Ravensbrück; the other two were Yvonne Baseden and Eileen Nearne. Four of the 8 female SOE agents, who were sent to Ravensbrück, were executed there, according to eye-witness testimony. Their names are Denise Bloch, Lilian Rolfe, Violette Szabo and Cecily Lefort. According to the testimony of Sylvia Salvensen, a former prisoner in the camp, Cecily Lefort was one of the women who died in the gas chamber on May 1, 1945. This was after the march out of the camp began and the marchers were overtaken by Russian troops. The SS man who was the second in command at Ravensbrück, Johann Schwarzhuber, gave detailed testimony in the British Military Court at Hamburg, where 16 staff members of Ravensbrück were on trial from December 5, 1946 to February 3, 1947. 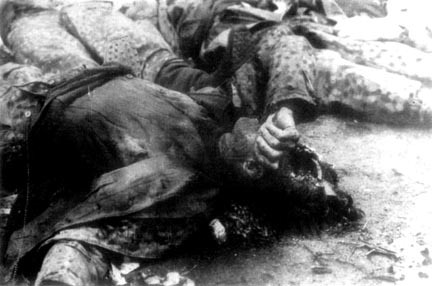 Schwarzhuber testified that SOE agents Violette Szabo, Lilian Rolfe and Denise Bloch were executed by a shot in the neck shortly after Schwarzhuber was transferred to the camp on January 12, 1945. Until Vera Atkins interrogated Schwarzhuber on March 13, 1946 and got him to confess to witnessing the murder of the SOE agents, nothing was known about the fate of these three women who had been at Ravensbrück since August 22, 1944. Schwarzhuber filled in all the details that Atkins wanted to hear, about how the women had died bravely and how the SS men had been impressed with their bearing. I previously blogged about Vera Atkins here. Schwarzhuber, who was on trial himself, said in the deposition taken from him by Vera Atkins and repeated in the courtroom, that Commandant Fritz Suhren had been annoyed that the Gestapo had not carried out these executions themselves. Suhren was not on trial since he had escaped from custody. Schwarzhuber also testified that Suhren had ordered him to organize a mass gassing of the women prisoners at the end of February 1945 at a time when sixty to seventy prisoners were dying each day during a typhus epidemic. Prior to being sent to Ravensbrück, Schwarzhuber had worked at Dachau, Sachsenhausen and Auschwitz II, better known as Birkenau. 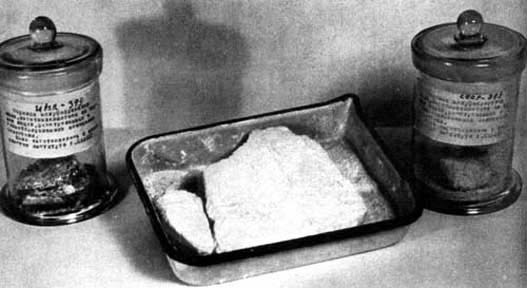 Schwarzhuber was convicted and executed on May 3, 1947. Schwarzhuber was the most important witness at the Ravensbrück proceedings; he had first told his story when he gave a deposition after being interrogated by Vera Atkins. How was Vera Atkins able to get Schwarzhuber to confess to crimes for which he knew that he would surely be executed? Did she threaten to turn his family over to the Russians, a threat that was usually effective? If any of the camp records were ever found, they were not released. All of the information about the women who were executed at Ravensbrück came from the testimony of Johann Schwarzhuber and from some of their fellow prisoners. Hitler “was able to seize power”? I thought he was appointed Chancellor of Germany because he was the head of the political party that got the most votes in a democratic election. Could the Jews have prevented his appointment if they had been able to carry guns in 1933? According to Joe the Plumber, the Jews had uncontrolled access to guns in 1933; he claims that there was no gun control until 1939. On August 7, 1920, the German government enacted a second gun-regulation law called the Law on the Disarmament of the People. It put into effect the provisions of the Versailles Treaty in regard to the limit on military-type weapons. So it was the Weimar government of Germany that passed gun control laws, not Nazi Germany, and it was long before 1939. In 1928, the German government enacted the Law on Firearms and Ammunition. This law relaxed gun restrictions and put into effect a strict firearm licensing scheme. Under this scheme, Germans could possess firearms, but they were required to have separate permits to do the following: own or sell firearms, carry firearms (including handguns), manufacture firearms, and professionally deal in firearms and ammunition. This law explicitly revoked the 1919 Regulations on Weapons Ownership, which had banned all firearms possession. So in November 1938, the Jews had access to rifles and shotguns, as well as ammunition. They could have attacked the Nazis on the night of Kristallnacht and taken over the German government. Why didn’t they? The Jews, who were sent to Dachau and other Nazi camps in November 1938, were released after two weeks, but only on the condition that they leave Germany immediately. A few of the Jews, who were arrested after Kristallnacht, remained in Dachau for as long as 3 years before they were released, as late as 1941, according to Theodor Haas, a Dachau survivor who was among the Jews taken into “protective custody” on November 9, 1938. Those who remained at Dachau had been unable to find a country that would take them. Haas had nightmares about the persecution he endured as a Jew in Nazi Germany. He survived the Holocaust only because he was released from Dachau in 1941, two years after World War II started, but before plans for the “Final Solution of the Jewish Question” were made on January 20, 1942 at the Wannsee Conference. In February 1942, deportation of the Jews to the death camps, in what is now Poland, began. Below is an excerpt from an interview with Theodore Haas, conducted by Aaron Zelman, founder of the organization called “Jews for the Preservation of Firearms Ownership.” Haas was living in America and was a member of this organization at the time that he gave this interview several years ago. we were armed before, we would not be here now”? took up 10 handguns and made asses out of the Nazis. Most news articles, about the American soldiers who liberated the Dachau concentration camp on April 29, 1945, mention that these veterans have never talked to their families about the horror of Dachau. Now one of the Dachau liberators, Don Ritzenthaler, has broken his silence and has told his grandson about what really happened at Dachau when the camp was liberated. Grandpa Ritz has never been able to talk about Dachau, other than to say he was there, and that what he saw was horrible. After reading about the place and what the Germans did to their mostly Jewish prisoners, I wasn’t surprised that the mention of Dachau rendered my typically effusive grandfather mute. But there always was something in Grandpa’s reaction that made me wonder: Was he haunted by more than just the ghosts of what he’d seen on April 29, 1945? According to the Official Report by the U.S. Army, there were 31,432 prisoners in the main camp on the day the camp was liberated. Among the survivors were 2,539 Jews who had been brought to the main camp from some of the 123 sub-camps just a few weeks before the liberators arrived. 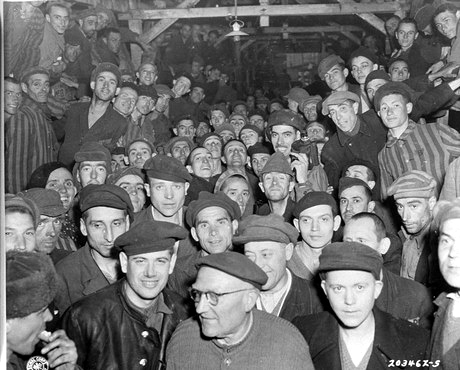 Most of the prisoners in the sub-camps of Dachau were Jews who had survived Auschwitz and had been brought on trains to Germany after Auschwitz was abandoned by the Germans in January 1945. Other Jews at Dachau on the day of liberation had been brought there from three Lithuanian ghettos in the Summer of 1944. 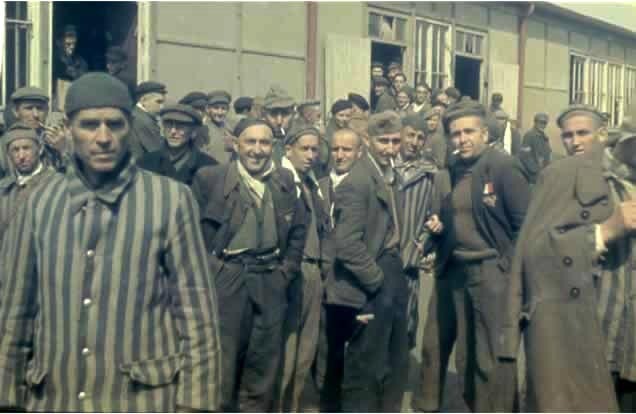 The American liberators got most of their information about the Dachau main camp from these Jews who had only recently arrived and were eager to tell their stories. Throughout its 12-year history, Dachau was mainly a camp for political prisoners, including Communists, Social Democrats, trade union leaders, spies, resistance fighters, and others who were considered “enemies of the state.” Also among the prisoners were Catholic priests, common criminals, Gypsy men, homosexuals, and asocials. Dachau was not a death camp for the genocide of the Jews. We’d heard that much before, and nothing more. But I always sensed that there was something more. I even had a pretty good idea just what that something was. “After what we saw, we shot any German guards we saw on sight,” Grandpa [Ritzenthaler] continued. The shooting of the “German guards” and a few Wehrmacht soldiers who were dragged out of a military hospital at Dachau, an event known as the Dachau massacre, was kept secret for over 40 years. I now knew that for 67 years, the uncharacteristically violent actions of this uncommonly gentle man had only multiplied the horror of what he’d seen, because he had become a participant in it. Of course, most of us would have done the same thing. But leaving hell with Satan’s blood on our hands makes us the Devil’s kin, even if it’s as distant cousins. It means we’ve surrendered to the very hate that so repulsed us in the first place. While he’s never said so, I can’t help but believe that this nexus of revulsion and revenge triggered something unrecognizable, something uncontrollable, in Grandpa, and it frightens him still. On April 29, 1945, SS 2nd Lt. Heinrich Wicker surrendered the camp to the 42nd Rainbow Division of the US Seventh Army, which had found the camp on its way to take the city of Munich, 18 kilometers to the south. Accompanied by Red Cross representative Victor Maurer, 2nd Lt. Wicker surrendered the Dachau concentration camp to Brigadier General Henning Linden, commander of the 42nd Rainbow Division, under a white flag of truce. The 45th Thunderbird Division of the US Seventh Army also participated in the liberation of Dachau, arriving at the nearby SS garrison before the 42nd Division approached the main entrance on the south side of the Dachau complex where 2nd Lt. Wicker was waiting to surrender the camp. Before reaching the concentration camp, the 45th Thunderbird Division had discovered an abandoned train, with no engine, on a branch railroad line which at that time ran from the Dachau station along Freisinger Street in the direction of the camp. Inside the 39 train cars were the corpses of prisoners who had been evacuated from Buchenwald on April 7, 1945 and, because of heavy bombing and strafing by Allied planes in the last days of the war, had not reached Dachau until three weeks later, two days before the American soldiers arrived. Most of the regular SS guards and the administrative staff had fled from the camp the next day and there was no one left to oversee the burial of the bodies. No precise figures are available, but the train had started out with approximately 4,500 to 6,000 prisoners on board and between 1,300 and 2,600 had made it to Dachau still alive. Some of the dead had been buried along the way, or left in rows alongside the tracks. The gruesome sight of the death train, with some of the corpses in the open cars riddled by bullets, so affected the young soldiers of the 45th Thunderbird Division that they executed Waffen-SS soldiers stationed at the Dachau garrison after they had surrendered. Upon entering the camp after the surrender, the American liberators, and the news reporters accompanying them, were horrified to discover over 900 dying prisoners in the infirmary barracks. According to the court testimony of the camp doctor, as many as 400 prisoners were dying of disease each day in the final days before the liberation. Accompanied by Communist political prisoners, who served as guides, the Americans toured the prison camp and were shown the building, just outside the barbed wire enclosure, which housed the homicidal gas chamber disguised as a shower room. 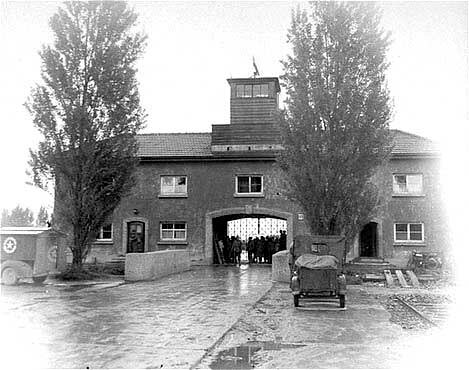 The Americans heard eye-witness accounts from Dachau survivors who said that prisoners had been gassed to death in the fake shower room; they also heard stories of how prisoners had been shoved into the crematory ovens while still alive. Bodies of fully-clothed dead inmates were found piled inside the new crematorium building and many more naked corpses were piled up outside. Outside the disinfection chambers, there was a huge pile of clothing waiting to be fumigated with Zyklon-B gas pellets. The so-called “guards”, who were killed by the Americans, were German and Hungarian SS troops who had been sent from the battlefield to help with the surrender of the camp. The men, who were killed by the American liberators, were completely innocent, but were murdered in cold blood by the Americans who didn’t bother to ask questions before shooting anyone they saw who was not dressed in a prison uniform. What I pray, though, is that he dies knowing he was nothing like the Germans who acted as Satan’s lackeys at Dachau. If he had been like them, he wouldn’t have shot them, because he wouldn’t have given a damn. I agree that, if Don Ritzenthaler had been like the Germans at Dachau, he would not have shot the “guards” who were wearing battle fatigues or the Wehrmacht soldiers who were recovering from war wounds in a hospital. He would not have shot anyone, after the Army that he was fighting with, had accepted the surrender of a camp that held mostly political prisoners. In doing reseach on the Buchenwald concentration camp, I came across the obituary of Phil Lamason in an article in the online Telegraph here, dated May 31, 2012. Phil Lamason was one of the 168 Allied airmen who were sent to the Buchenwald concentration camp as illegal combatants because they were caught wearing civilian clothes behind enemy lines, hiding with the French Resistance. Squadron Leader Phil Lamason, who has died in New Zealand aged 93, was the leader of a group of Allied airmen sent to Buchenwald concentration camp by the Gestapo. Once at Buchenwald, he risked his life on numerous occasions as he sought to obtain the men’s release and to smuggle news of their plight to the Luftwaffe — RAF prisoners of war were the responsibility of the Luftwaffe, not of the Gestapo. By negotiating with the camp authorities he was able to secure extra blankets, clothes, clogs and food for the airmen. In October he learned that the Gestapo had ordered their execution, and he increased his efforts to secure the fliers’ release. On October 19, Luftwaffe officers arrived at Buchenwald and demanded the airmen’s release, and they were transferred to Stalag Luft III, where their shaven-headed, emaciated appearance shocked their fellow PoWs. Lamason may have tried his best to get the airmen released to a POW camp, but were the airmen really released because of his efforts? Well that day we woke….the next following day, we came out and they counted us early in the morning with snow on the ground — just a little bit. And they told us that the first ten were going to be hung. And we looked at him and we looked at each other, and we saw them marching ten other different people from the other area who were Canadians. They put these ten Canadians up there on the rafters and they accused them of sabotage and murder and other situations as they went by. And there was a well-speaking English German who read the convictions in English. And as he completed all ten of ‘em he says “Now you will pay your supreme sacrifice for your country,” he says “because you are about to die.” They pulled it and the bottom fell out from beneath the platform, and ten of them hung there, and we had to stand and watch them hang until sunset. He said, “Next is the Americans.” Then he came by and he called our names and I was on the first list. He said, “You’ve got three days.” And I said, well, this is gonna be it. I’ve got three days to make peace. And about that time, it so happened it fell on a weekend, and the commandant and the so-called medical doctor of Buchenwald and several others, were on a weekend pass when a lieutenant died in my arms, Jack Beck. He died in my arms from malnutrition, infection and he just couldn’t hold on anymore…dysentery just claimed his body. And we got a hold of the outside guard and we told him what happened. And being that the German is a very regulated type of person, he went and got his sargeant (sic). The sargeant says, “Well, there’s got to be a death certificate made out. Does somebody know his name?” I told him, yes, I did. He says, “Good.” He says, “We’ll have a doctor here in a little while. You help the doctor make out the death certificate.” And it so happened, approximately and hour later or so, this blue uniform walked in, a German captain. He said he was the doctor, Luftwaffe, and he understood that there was a person who died here and had to have papers made out on the death certificate. But why would a Luftwaffe doctor have been sent to Buchenwald? It just so happens that the Luftwaffe maintained a small airfield near Weimar, which was 5 miles from Buchenwald. This was the closest place to find a German doctor who could sign a death certificate when the Buchenwald doctors were off duty on the weekend. We all got up, Martini and five of us did, and we gave him our rank, name and serial number. And he says, “Don’t anybody move from this square. Don’t anybody be talked out of leaving this area.” He says, “I’ll post two men right now over at the gate. Nobody comes in or out.” So he went out and it was a couple hours later that we saw this big train. The big train took the Allied airmen to Stalag III, a POW camp. I previously blogged about a documentary on the story of the airmen at Buchenwald here. I also wrote a review of the documentary here. You can read the full story of Edwin Ritter on my blog here. I received an e-mail yesterday from Dave Pinkley who gave me his father’s story about the liberation of the Buchenwald concentration camp. His father, Herbert Pinkley, was a tank driver/gunner in the 6th Armored Division which is credited by the United States Holocaust Memorial Museum with being the liberators of Buchenwald. I previously blogged about the liberation of Buchenwald here. Pfc. James Hoyt has been credited with driving the M8 armored tank which brought Capt. Frederic Keffer, Tech. Sgt. Herbert Gottschalk and Sgt. Harry Ward to the Buchenwald camp around 5 p.m. on April 11, 1945. He parked the vehicle outside while Capt. Keffer and Sgt. 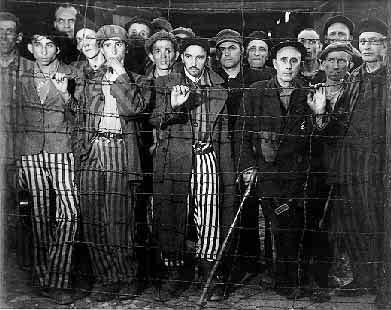 Gottschalk (both of whom spoke German) went through a hole in the barbed wire fence that had been made by the prisoners. According to his son, Herbert Pinkley “is not listed in the rolls, probably due to the main incident” described in his e-mail letter. I have no trouble believing that an American soldier beat a German officer after discovering that he had been associated in some way with the Buchenwald camp. However, I have difficulty in believing that a German officer would report this incident to “U.S. officials” and that Herbert Pinkley’s name would be removed from the official story of the liberation of Buchenwald because of this. Read more stories about the liberation of Buchenwald on my web site here. According to The Buchenwald Report, in the first days after the liberation of the Buchenwald camp, the political prisoners who had been freed by the Americans, hunted down 76 of the camp guards who had escaped into the surrounding woods; they were brought back to the camp and killed. American newspaper reporter Marguerite Higgins wrote in her book News is a Singular Thing, that 20 to 30 American soldiers took turns beating 6 young German guards to death at Buchenwald.